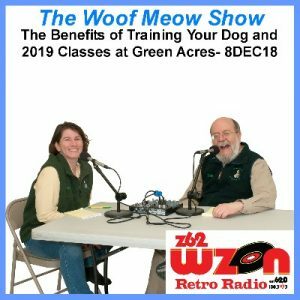 In this episode of The Woof Meow Show from December 8th, 2018 Kate and Don discuss the many benefits of training your precious pup. They consider how teaching your dog to have some basic manners can allow your dog to be with you more often and in more places. They address how training will help keep your dog safe and how it can strengthen the bond between you and your canine companion. Next Don and Kate discuss what to look for in a dog trainer and what to avoid. They also help you learn what to look for in a dog training class. Lastly, they review the dog training classes Green Acres Kennel Shop has scheduled for 2019. How to choose a dog trainer – Kate and Don discuss what to look for when selecting a dog trainer and dog training class, as well as what to avoid. Dog training and recommended approaches to training a dog have changed dramatically as we have learned more about canines. As a result, we now know that some long-standing methods used to train a dog in the past, are in fact detrimental and can cause severe and long-term harm to your dog. Learn what to look for so that you and your dog have the best experience possible. If You Love Dogs or Work with Those Who Love Dogs, You Need to Read This Book! 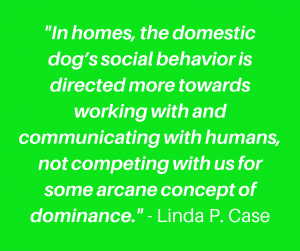 What we know about the science of canine behavior and dog training is continually evolving. As such, every year I like to select a new book to recommend to my students, my staff, area veterinarians, and my colleagues that I feel will be the most beneficial to them and their dogs. This year I have chosen Dog Smart: Evidence-based Training with The Science Dog by Linda P. Case. 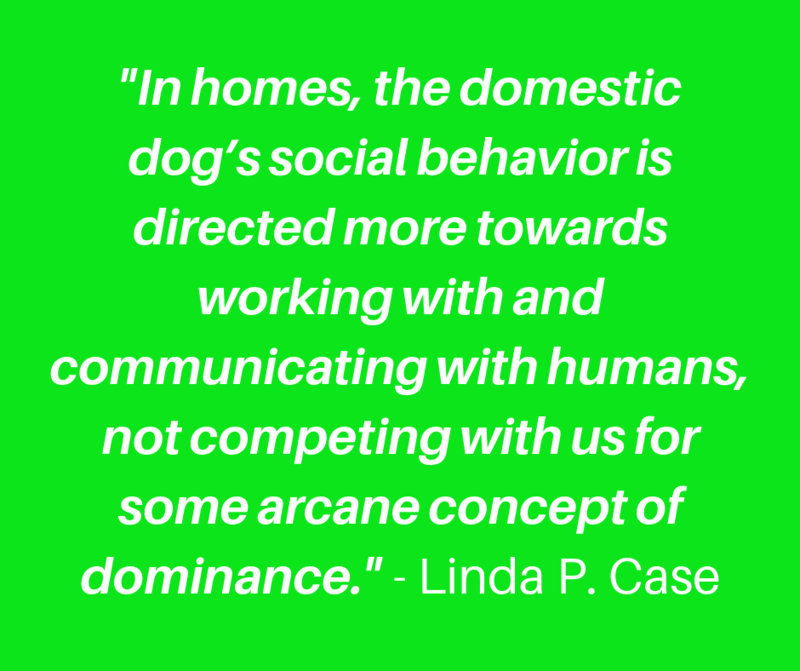 At the beginning of her book, Case states she has two primary objectives: “…to provide accurate summaries of some of the most important evidence regarding present day understanding of the dog’s history and domestication, behavior, social cognition, and learning process.” and “… to apply this information to practical dog training methods and to provide means for communicating this information and teaching these methods in ways that are both interesting and useful to all dog owners.” From both my perspective as a pet care professional and as a pet parent, I believe that Case has met her objectives admirably. Those of you familiar with my column know that I am passionate about setting the record straight on the following; dominance ( http://bit.ly/Things-Gus-Dominance ), dog breeds ( http://bit.ly/DoesDogBreedMatter ), the importance of puppy socialization ( http://bit.ly/SocializationPuppy ), and the unnecessary use of aversives for the training dogs. ( http://bit.ly/RewardVSAversive ). Case addresses all of these issues thoroughly. 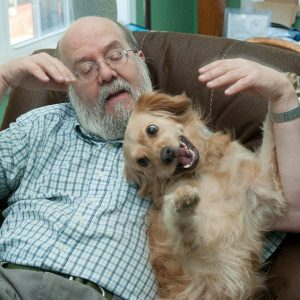 The idea that one must be dominant or the “Alpha” with their dog has probably done more damage to the human-dog relationship than any other piece of bad advice given by anyone about dogs. Case does an excellent job of getting into the scientific details about dominance. She clearly explains how dogs and wolves are related and how they are also very different. Case then goes on to discuss the scientific view of how the dog evolved and eventually became our companion. 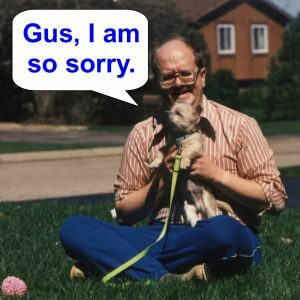 No discussion of that process would be complete without a review of how humans developed a seriously flawed theory called the “hierarchical model of pack behavior” which led to the false belief that we had to dominate our dogs and physically punish them to ensure we were always in control. Case uses science to explain how this model has been refuted and goes on to state “A parent-family model better describes wolf relationships in packs than does an outdated hierarchy model that focuses on strict social roles and conflict.” If you are a trainer and having difficulty explaining this to your clients, or a pet parent trying to explain this to other family members, you need to purchase and share this book. Dog breeds and how they influence behavior. Anyone thinking of getting a dog should read this section before deciding which kind of dog they want as a companion. The critical importance of adequate and appropriate puppy socialization and habituation. Case explains why early socialization is crucial to a puppy’s development but adds a very important warning; if you do not do it right, you may create behavioral problems. Socialization is one of those issues that I find far too many alleged “dog experts” do not understand well. They are all perfect candidates for this book. As a pet care professional, I have found the biggest obstacle to helping my clients, and their dogs are often the erroneous beliefs they have acquired about dogs and their behavior from the internet, TV, friends, family, and sadly even ill-informed pet care professionals. The American Animal Hospital Association (AAHA) acknowledged this as a serious problem in 2015 when they published their 2015 Canine and Feline Behavior Guidelines. Unfortunately, this document was not written for Jane and Joe Pet-Parent and does not offer the additional wise counsel found in Dog Smart: Evidence-based Training with The Science Dog. Linda Case, thank you for filling that void! For those that want to know as much as possible, Case has also provided ample references to the scientific articles supporting her work. 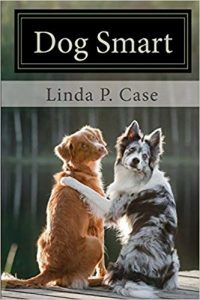 If you love your dog, or if you work with people that love their dogs, you owe it to them to read Dog Smart: Evidence-based Training with The Science Dog by Linda P. Case. It is the smart thing to do. Don Hanson is the co-owner of the Green Acres Kennel Shop ( greenacreskennel.com ) in Bangor, Maine where he has been helping people with their pets since 1995. He is a Bach Foundation Registered Animal Practitioner (BFRAP), Certified Dog Behavior Consultant (CDBC), Associate Certified Cat Behavior Consultant (ACCBC) and a Certified Professional Dog Trainer (CPDT-KA). Don is a member of the Pet Professional Guild (PPG) and is committed to PPG’s Guiding Principles and the Pain-Free, Force-Free, and Fear-Free training, management, and care of all pets. Don produces and co-hosts a weekly radio show and podcast, The Woof Meow Show heard on AM620 WZON and streamed at http://www.wzonam.com/ every Saturday at 9 AM. Podcasts of the show are available at http://woofmeowshow.libsyn.com/. Don also writes about pets at his blog: www.words-woofs-meows.com. The opinions in this post are those of Don Hanson. This article is a work-in-progress but if you attended my seminar at the P.A.W.S. Animal Adoption Center on 10NOV18, I wanted you to have at least an outline of what I discussed. I encourage you to check back at this link < http://bit.ly/DogTrainingKeysToSuccess > as I finalize this article. Training a dog to sit, or down, or to come when called will not typically resolve the dogs fear or anger. Asking a dog to do something counter to their emotional instincts may in fact make their emotional response more severe. This is often misunderstood by trainers, veterinarians, and shelters or rescue groups. Those that are unaware may suggest that a dog with aggression or reactivity issues towards dogs or other people, or both will improve with obedience training. While such training can be wonderful for helping an unruly dog to learn manners to make them easier to live with, it will not inherently make their fear go away or their anger dissipate. If a dog is reacting to people or other dogs, putting them in an environment where they are confronted by their triggers may in fact make their reactive behavior become more likely and more intense. Dogs and the people who love them can be helped but they would be better off working with a Certified Dog Behavior Consultant (CDBC) or a veterinarian accredited by the American College of Veterinary Behaviorists (ACVB). It is also imperative that no aversive of any kind are used with these dogs as a response to their reactivity or aggression. Work As A Team & Be Consistent – ALWAYS! Training your dog will be much easier if you and your dog have a relationship based on mutual trust and acceptance and the simple fact that you enjoy being with one another. The old model of dog training was based on the idea that you and your dog were on two different teams. I can tell you that after twenty-three plus years of working with people and their dogs, those that view themselves as being on the same team and working together are not only happier but they are also more successful. If your dog lives with more than one person, or frequently is around other people, you need to recruit those people to join the team and to work with you and your dog. It only takes one person around your dog to undo what you and your dog have accomplished together. You know that one person that continues to encourage and reward your dog for jumping up on them? They are not helping. Even extended family members, those that might only see your dog every couple of months, can and should be part of the training process. Consistent rules, training methods, and cues are essential to successfully training your dog. All those involved need to understand and be doing things in the same manner. At some point, almost all dogs will exhibit a behavior we do not like. While we do not need to accept these behaviors, in most cases, we do not always need an elaborate training solution to stop the behavior. Sometimes the simplest and most effective solution is to use are allegedly more powerful brains to develop a strategy to prevent the behavior. For example, if our dog is anxious and uncomfortable around the grandchildren when they visit once a year, keep the dog in another room with their favorite toys or board them when the grand kids come to visit. Equally important to ignoring undesirable behavior is the need to reward behavior you like. A reward can be many things and will vary from dog to dog, but in most cases, it will be food. If you ignore the dog when they jump up on you and instantly reward them with a tiny morsel of food the instant they have all four feet on the ground, they will learn much faster. One of the most frequent errors I see people make when training there dog is to failing to reward behavior, or to stop rewarding the behavior before it is firmly established. Directly related to rewarding behavior is the quality of the treat you are using. Just as most people would find a piece of fine chocolate more rewarding than a stale saltine cracker, most dogs will find a tiny piece of meat more valuable than the largest dog biscuit. The frequency of the reward is also important, especially when training in more distracting environments or when working on more difficult behaviors like walking on a loose leash. If you are not making progress, try rewarding more frequently. Sadly, it seems to be human nature, mine included, to be more likely to react when our dog is doing something we do not want than it is to acknowledge desired behavior with a reward. If you enjoy your dog when they are lying at your feet or calmly sitting in your lap, do not forget to reward them. If our employer forgot to pay us, would we be happy? Remember, behaviors that are rewarded consistently will be consistently repeated. People like to talk hoping their dog will listen and perform a requested behavior, while dogs like to watch not understanding the need for all the chatter. Remember dogs are visual creatures. Start by training a visual cue before you even think about adding a verbal cue. Do not add a verbal cue until the visual cue is reliable; the dog responds 90 times out of 100 in any environment, context or situation. Dogs typically never develop a reliable response to a cue because people do not adequately train the cue and do not sufficiently reward the desired behavior. Visual and verbal cues need to be consistent among all of those training the dog; they need to look the same. Remember your dog is great at discriminating tiny differences while they generalize poorly. I also find that many people like to give visual cues like a “fast-talking” urbanite that has consumed five Red Bulls too many. Or alternatively, a visual cue where the individual giving the cue has so many moving body parts, it looks like a pitcher winding up to win the World Series. Make your visual cues slow, deliberate, and simple. Consistency is equally important with verbal cues. There is a difference between: “sit”, “siiiit,” “sit sit, sit?” and “can you sit?” Again, keeping a verbal cue short, deliberate, and simple will make training easier. Also, make sure a verbal cue for one behavior does not sound like that for another behavior. ALWAYS Keep Training FUN! – ALWAYS! If a training session stops being fun for either you or your dog, STOP and go do something you will both enjoy. If that is not possible, STOP and seriously evaluate why training is no longer fun. Back when I first started training dogs professionally, I was still taking my Cairn Terrier Gus to classes on a regular basis. At one point, Kate, our class instructor, witnessed what was probably the least enthusiastic recall she has ever seen. Gus and I were at opposite ends of our field when I gave him his cue to come. He came but at the slowest pace possible, acting like he wanted to do anything but come to me. At the end of the class, after the other students had left, Kate took me aside and politely kicked us out of class. She observed that neither Gus nor I were having fun and that training was damaging our relationship. She suggested we just go and have fun. It was the last class Gus and I were part of, and we had a great relationship the rest of his life. Thank you Kate for such good advice and your honesty! No matter how many dogs you have trained or how many training classes you have attended, I would encourage you to work with a Force-Free, Certified Professional Dog Trainer (CPDT) every time you bring a new dog into your home. Such an individual has proven their knowledge experience through a rigorous examination and will typically have experience with more dogs and a wider variety of breeds and temperaments than you ever will. They should also be committed to force-free, fear-free, and pain-free training, as any other type of training will be counter-productive. Even though I am a CPDT I take my dogs through classes taught by others. Many of my colleagues do the same. Help you understand your dog’s physical, mental and emotional needs. Teach you about the myths and facts about dog behavior. Help you to understand how your dog communicates. Teach you how to most effectively and efficiently teach and reward behaviors. Help prevent you from unintentionally rewarding undesired behaviors. Coach and reward you on what you are doing, because it is not just your dog that is learning. Teach you the importance of being proactive and not just reactive. Help you set realistic expectations for your dog, you and your family, and your situation. Show you the benefit of making training FUN! for both you and your dog. In addition to teaching people how to train their dogs, I also help people that have dogs with often extremely serious behavioral issues such as aggression and separation anxiety. In my twenty-three years of training and working on behavioral cases, the vast majority of dogs I have seen for behavioral issues have never been trained. Training, when done proactively, can prevent behavioral issues. 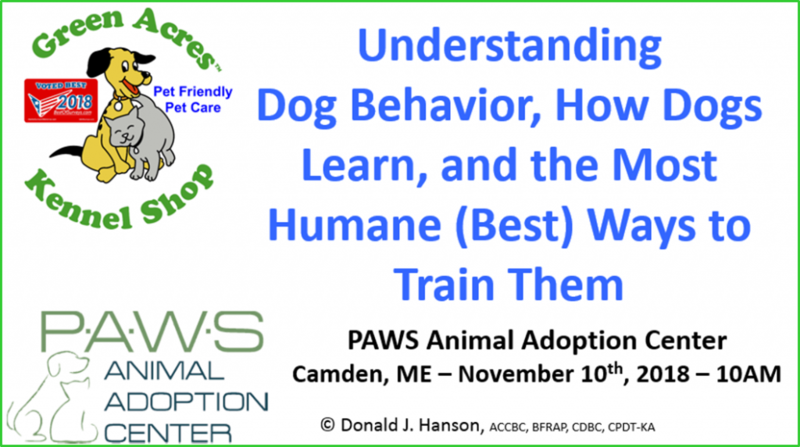 On Saturday, November 10thth, Don Hanson of the Green Acres Kennel Shop presented a seminar for the P.A.W.S. 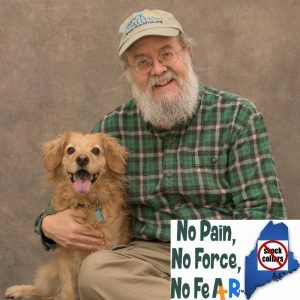 Animal Adoption Center of Camden, Maine entitled Understanding Dog Behavior, How Dogs Learn, and the Most Humane (Best) Ways to Train Them. This blog article contains links to articles and podcasts that may be used as a reference to material presented at the seminar. Dog Smart: Evidence-based Training with The Science Dog, Linda P. Case, CreateSpace Independent Publishing Platform, 2018, If you love your dog, or if you work with people that love their dogs, you owe it to them to read Dog smart: Evidence-based Training with The Science Dog. The Power of Positive Dog Training, Pat Miller, Howell Book House, 2001. I have been reading Pat Miller’s articles in the Whole Dog Journal for years and have loved everything she has written. She is a skilled and compassionate dog trainer who really knows how to communicate to dog owners through her writing. This book is a superb “basic dog book” for anyone with a dog, and I highly recommend it. The Other End of the Leash – Why We Do What We Do Around Dogs, Patricia B. McConnell, Ph.D., Ballantine Books, 2002, An information-packed, immensely readable book. In it you will learn how to have a better relationship with your dog through better communications. Dr. McConnell clearly explains the manners in which dogs and their people communicate. For the Love of A Dog Understanding Emotion in You and Your Best Friend, Patricia B. McConnell, Ph.D., Ballantine Books, 2005, 2006, A superb review of emotions in both dogs and their people and how they bring us together and can rip us apart. Once again Dr. McConnell helps us to better understand our dogs and in doing so have the best possible relationship with them. Dogs: A new Understanding of Canine Origin, Behavior and Evolution, Raymond and Lorna Coppinger, University of Chicago Press, 2001, An evolutionary biologist and dog lover, Coppinger outlines the likely process that resulted in the longstanding canine-human relationship. 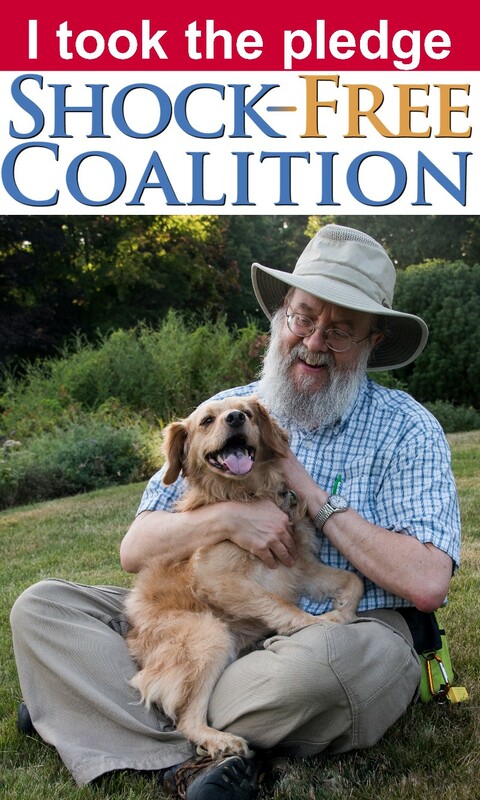 It was a year ago that I first wrote about the formation of the Shock-Free Coalition, an international initiative that “…believes that pets have an intrinsic right to be treated humanely, to have each of their individual needs met, and to live in a safe, enriched environment free from force, pain and fear. Members of the Shock-Free Coalition consider it to be their responsibility and utmost obligation to be vigilant, to educate, to remain engaged and work toward eliminating shock as a permissible tool so it is never considered a viable option in the training, management and care of pets.” ( FMI – http://bit.ly/BestFriendsAndShock ). In January of 2018 electric shock collars were banned in Scotland. A paper published in Volume 25 of the Journal of Veterinary Behavior by Dr. Sylvia Masson et al. discussed electronic shock collars used to address barking, containment (underground fences), and remote training. The paper’s authors concluded “...there is no credible scientific evidence to justify e-collar use and the use of spray collars or electronic fences for dogs. On the contrary, there are many reasons to never use these devices. Better training options exist, with proven efficacy and low risk.” and recommend that the sale, use, and promotion of shock collars be banned. The Pet Professional Guild (PPG) has designated Saturday, November 17th, 2018 as the first-ever International Day of Advocacy to celebrate its official launch of the Shock-Free Coalition one year ago. The focal point of the celebration will be Let’s Celebrate +R, a photo and video competition where pet professionals and enthusiasts can showcase the best of positive reinforcement-based pet training and education. Let’s celebrate +R is a competition open to all who wish to advocate for force-free training by demonstrating their skills as a way to promote the educational message of pain-free, force-free, and fear-free training. Most people do not want to harm their dog and do not understand that shock collars work by causing physical and emotional pain and fear. To participate in the International Day of Advocacy 2018, all you need to do is take a photo and/or make a short video and submit it to one of the Let’s Celebrate +R competition categories. There are three competition categories in both photos and videos. The contest will run from November 10th through November 24th and is open to all. Winners and runners-up from each category will have the opportunity to win fabulous prizes! The winners from each of the six categories will then be forwarded to the final judging category, Best Overall Entry. 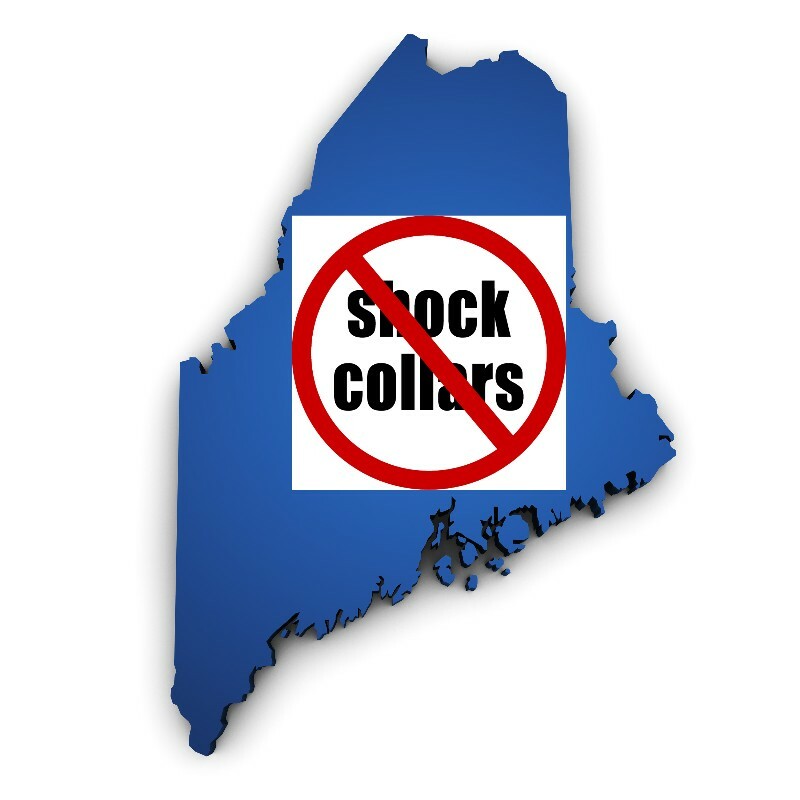 If you want to learn more about shock collars and why the Shock-Free Coalition believes that their use, sale, and promotion should be banned, I encourage you to visit these two sites – http://bit.ly/ShockCollars or https://www.shockfree.org/About/What-Experts-Say. The scientific evidence against the use of shock is overwhelming with no scientific evidence to support its use. Thank you for helping to make the life of pets free of pain, free of force, and free of fear. Don Hanson is the co-owner of the Green Acres Kennel Shop ( greenacreskennel.com ) in Bangor, Maine where he has been helping people with their pets since 1995. He is a Bach Foundation Registered Animal Practitioner (BFRAP), Certified Dog Behavior Consultant (CDBC), Associate Certified Cat Behavior Consultant (ACCBC) and a Certified Professional Dog Trainer (CPDT-KA). Don is a member of the Pet Professional Guild (PPG) and is committed to PPG’s Guiding Principles and the Pain-Free, Force-Free, and Fear-Free training, management, and care of all pets. Don produces and co-hosts a weekly radio show and podcast, The Woof Meow Show heard on AM620 WZON and streamed at http://www.wzonam.com/ every Saturday at 9 AM. Podcasts of the show are available at http://woofmeowshow.libsyn.com/. Don also writes about pets at his blog: www.words-woofs-meows.com. 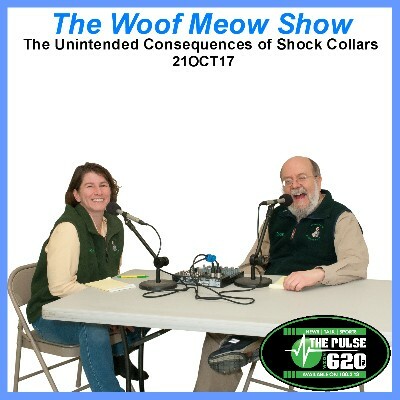 In this episode of The Woof Meow Show from October 21, 2017, Don and Kate discuss electronic shock collars. While Don and Kate would never recommend using a shock collar on a dog for any reason, they recognize that not everyone who uses a shock collar on their dog does so understanding the harm it can cause. Sadly, often the companies that sell and manufacture shock collars do not provide you with all of the information you need to make an informed decision. What can people concerned about a dogs well-being do to help prevent dogs from getting shocked? Is Your Dog Your Best Friend or a Family Member? Dogs were first referred to as “Man’s best friend” in 1789 by Frederick, King of Prussia. Today it is not uncommon for a person to say that they consider their dog to not only be their friend but to be a member of their family. That is how I view both my dog and cats. In spite of this apparent devotion to dogs, there are still too many people in this country that routinely use electronic shock collars to subject their dogs to shock on a regular basis, all in the name of training and containment. When a dog receives an electric shock from a shock collar, the shock is meant to be sufficiently aversive to change the dog’s behavior. An aversive typically causes either physical or emotional pain or both. If the dog does not find the shock aversive, the shock will not stop the behavior. That is basic psychology. Rewarding a dog for a behavior causes that behavior to increase, and punishing a dog or adding an aversive, causes a behavior to decrease. Those that insist the shock does not hurt the dog and that it is merely a “stim” or “tickle” are either misleading people or do not understand the fundamentals of psychology and learning theory. What makes the use of electric shock on animals even more distressing than the fact that we are intentionally hurting our pets, is that science has demonstrated that the use of punishment is unnecessary to train or manage a pet. In fact, we know with certainty, that the use of shock and other aversives can be extremely detrimental. The use of aversives can damage the bond we have with our pet, impair our pet’s ability to learn, and often cause fear and aggression. Considering that shock is unnecessary, its use amounts to nothing less than abuse. So I ask, why would anyone intentionally abuse their best friend or a family member? Since its beginnings in 2012, The Pet Professional Guild (PPG) has advocated against the use of aversives in the training and management of pets. In 2015, the American Animal Hospital Association (AAHA), an accreditation body for veterinary practices and hospitals, issued their Behavior Management Guidelines. The guidelines clearly state: “Aversive techniques include prong (pinch) or choke collars, cattle prods, alpha rolls, dominance downs, electronic shock collars, lunge whips, starving or withholding food, entrapment, and beating. None of those tools and methods should be used to either teach or alter behavior.” [Emphasis added]. 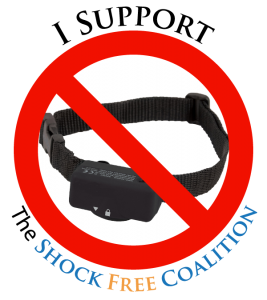 The experts on our pets health, behavior, and training agree; shock should NEVER be used. Whether the use of electric shock is intentional, due to casual disregard because “it is just a dog,” or due to ignorance, I and many others believe it is time for this inhumane treatment of our best friends and family members to stop. On September 25th the Pet Professional Guild (PPG) launched the Shock-Free Coalition ( http://www.shockfree.org ) “…an initiative that aims to build an international movement committed to eliminating shock devices once and for all in the care, training and management of pets.” This noble cause is long overdue and one that I support without hesitation. I hope that you will join me in this movement to educate and advocate for the abolishment of the use of shock devices for the management and training of our best friends and family members. Please take the first step, and join me by taking the pledge at http://www.petprofessionalguild.com/Sign-The-Pledge. What else can you do to support the Shock-Free Coalition? Dog Parents – Ask any and every pet care provider that participates in the care of your dog (animal shelters, boarding kennels, breeders, daycares, dog walkers, groomers, humane societies, pet related periodicals, pet sitters, places you buy pet food and supplies, rescues. Veterinarians, ) if they are aware of the Shock-Free Coalition and if they have taken the pledge. Encourage them to do so. If they chose not to take the pledge, ask them why. Suggest that they do some research and reconsider. You might even provide them with a copy of this column. If they are still unwilling to take the pledge, remember, you can choose who gets your pet related business. Sometimes money speaks louder than words. Pet Care Professionals – Take the pledge and make your support known to your employees, customers, and clients. Tell them about the pledge and ask them to take it as well. Show your support for the Shock-Free Coalition with signs in your facility, articles in your newsletter, information on your website, and with posts on social media. I know that pet parents care about this issue and they want to know that you care too! [Bangor] – Green Acres Kennel Shop is honored to be part of the Shock-Free Coalition, a global initiative launched today, by the Pet Professional Guild (PPG). The PPS is an international membership association for animal behavior and training professionals. 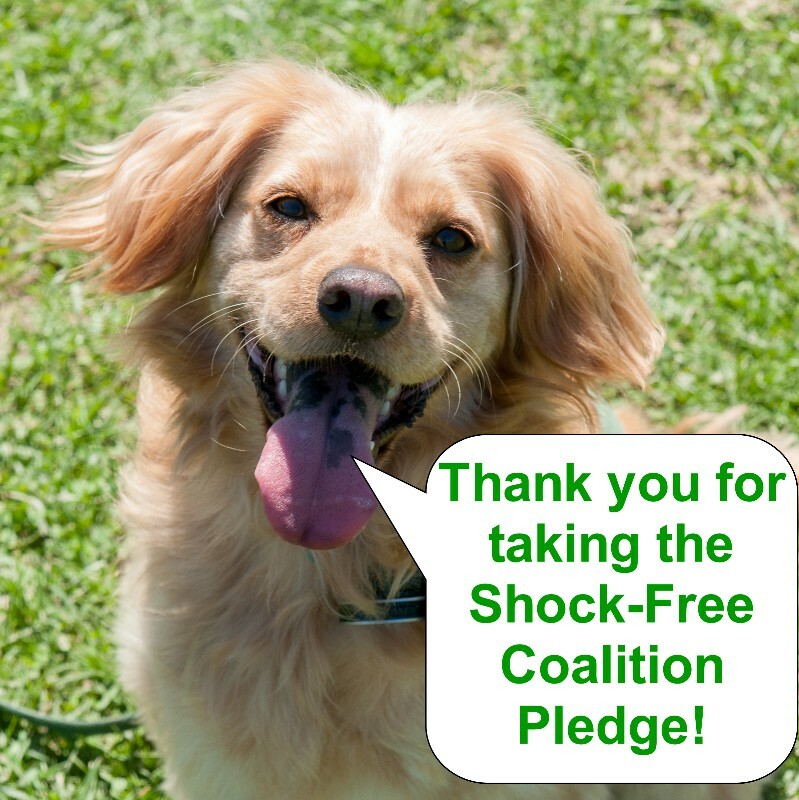 The Shock-Free Coalition aims to end the practice of using electric shock to train and care for pets. I am astounded and disappointed that it is still legal in many countries, including the USA, for pet owners to deliver an electric shock to a collar worn by their cat or dog via the simple press of a button from a remote control. Countless studies, conducted by veterinary scientists and canine behavior specialists, indicate that using pain and fear to train animals can cause physical injury, as well as a host of psychological issues that may include their becoming fearful of other animals and people — and potentially aggression. The American Animal Hospital Association (AAHA) explicitly states that shock collars nor any other aversive should be used to train or manage animals in their Behavior Management Guidelines of 2015. Anyone who loves animals and wishes to share their support for this initiative may do so by taking the pledge by clicking on the graphic to the left or the following link www.shockfree.org. You may also learn more at the Shock-Free Coalition website. An article by Green Acres Kennel Shop owner, Don Hanson, The Unintended Consequences of Shock Collars, can be found on his blog at http://bit.ly/ShockCollars If you wish to participate in a Maine based shock-free coalition, you may learn more by clicking on the graphic to the right or on the following link http://bit.ly/Shock-FreeME. In business since 1965, Green Acres Kennel Shop, located at 1653 Union Street, is committed to pet-friendly, force-free pet care. We offer boarding, daycare, and grooming for dogs, as well as pet behavior consultations and group and private dog training classes. Voted Best Kennel every year since 2002, Best Pet Store every year since 2007, Best Dog Trainer every year since 2011, and Best Pet Groomer every year since 2013, the Green Acres retail store offers a wide variety of wholesome pet foods, treats, and quality supplies. In December of 2016, we were recognized by Best Businesses of America as one of the Top 15 Kennels and Top 40 Dog Trainers in New England. We are a proud member of The Pet Professional Guild. For more information, please call 945-6841 or visit www.greenacreskennel.com.